When the Sun is well overhead, the floor of the Mare Tranquillitatis pit is illuminated. With an incidence angle of 26.5° and a shadow of 55 meters, scientists can estimate the depth to be a bit over 100 meters. That estimate is from the edge of the shadow, which begins a slightly downslope from the gradual margin of the pits. 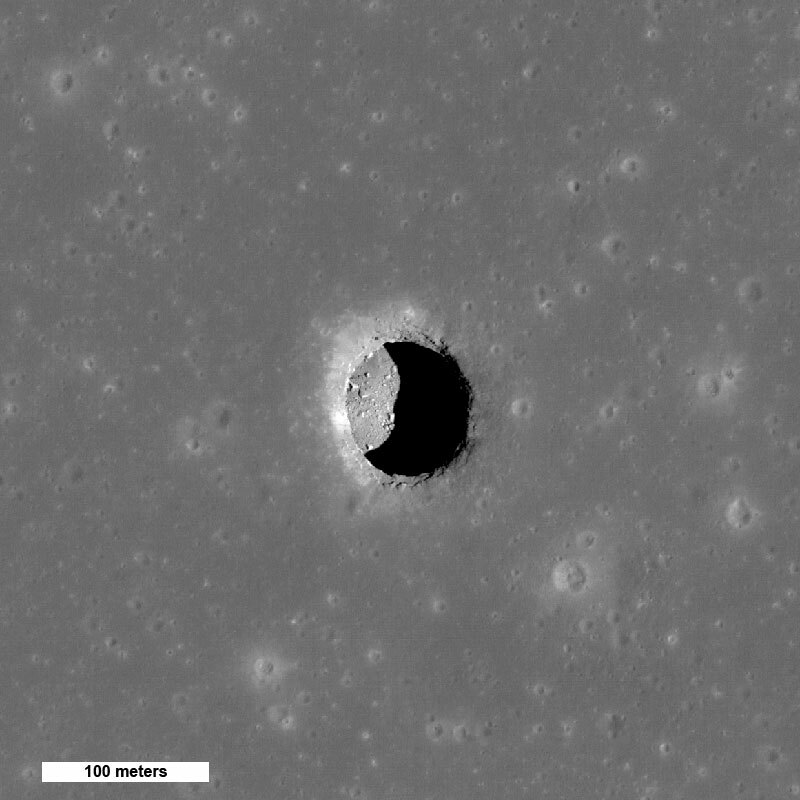 When measured from the level of the surrounding mare plain, the depth of the pit is even greater. Compare this depth to the width, which ranges from 100 to 115 meters across the sharp precipice. Two views of Mare Ingenii pit. Credit: NASA/GSFC/Arizona State University. A pair of Mare Ingenii pit images (each panel is 150 meters wide) reveals different portions of the floor as the Sun crosses from West to East (Left M123485893RE, Right M128202846LE). Shadow measurements indicate that the Ingenii pit is about 70 meters deep and its width is about 120 meters. The Sun angle, direction, and elevation perfectly illuminate the layered nature of the mare basalts. Each shelf corresponds to a local lava flow event. By climbing down this "staircase" a geologist astronaut can sample increasingly further back in time. LROC has now imaged the Marius Hills pit three times, each time with very different lighting. The center view has an incidence angle of 25° that illuminates about three-quarters of the floor. The Marius pit is about 34 meters deep and 65 by 90 meters wide. Read more about the Ingenii, Tranquillitatis, and Marius pits. Do any of these pits provide access to still-open/uncollapsed lava tubes? What could be learned by visiting and exploring one or all of these fascinating features? Imagine entering a preserved lava tube, unchanged for more than 3 billion years; such an opportunity is a geologist's paradise - a chance to travel back in time to see what brand-new lava flows look like! What types of rare minerals might exist on these hidden surfaces (if they exist)? How would you like to explore this amazing feature?